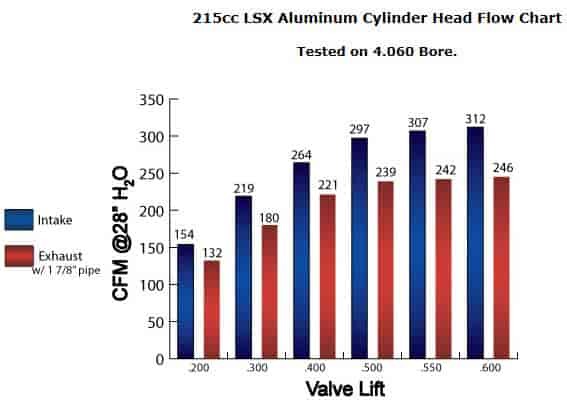 In keeping up with the GM's trend of larger bore sizes and increased displacement, AFR offers this 215cc LS1/LS2/LS6 version of this ever popular Gen III product line which is aimed specifically to maximize 4.000'' bore combinations, 364 - 408ci. However this head is very versatile and could also be considered for aggressive 346 applications. The 215cc head should also be a prime consideration in larger stroker motors as well around 415-430ci, if the focus of the build is more aimed at enhancing street performance than all out strip performance (where AFR's 230 or 240cc offerings potentially make more sense). This is a very effective design offering serious velocity while still being able to provide a significant volume of airflow enough to generate well over 600hp at the crank. This head will also work well on any forced induction or nitrous applications from 346-408ci; larger engines should look to the 230cc offering. Note that the AFR 215cc requires a minimum head gasket bore of 4.135'' regardless of bore size and is a direct bolt on requiring no special parts. It of course comes equipped with AFR's trademark 3/4'' thick deck and thicker port and combustion chamber surfaces as well. Made in USA.